Beautiful Art: Another Fairy House Creation displayed in our new Gallery! The house is about 18" tall, is very detailed and unique and beautiful. If anyone is interested in having us make a similar Fairy House for them, let us know!! We love creating one-of-a-kind houses for people!! It's so much fun!! Hope you are having a wonderful week, everyone! j'aimerais habiter cette peitte cabane !!!! oh my, I've at a loss for words, I've never seen anything like this! 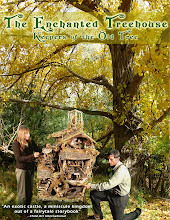 Hi, I was just wondering what you used for the base of your really big fairy house, the 5 foot tall one? Did you use a gnarled tree root to support it or did you just build it off the ground? Inside the Curious Menagerie of Art! !